Packaging innovation is typically sparked by a combination of technological advances and evolving consumer preferences. In most cases, new packaging alternatives are developed to improve upon old designs, ultimately replacing them in the marketplace. And each new solution brings its own set of advantages. Some emerging solutions are more affordable than traditional methods, while other packaging improvements do a better job protecting goods for transport and display. Still other upgrades enhance shelf life and security, using forward-looking technology to protect perishables and maintain the integrity of food and non-food products. As their popularity continues to expand, flexible pouches share many of these advantages – particularly when compared to traditional alternatives. But until recently, flexible pouches were strictly throwaways, making them impractical for producers and consumers committed to sustainable packaging. Cutting-edge innovation is changing that, however, as materials advances make pouch packaging recycle ready. In a trend impacting many consumer industries, the food and beverage packaging industry has seen a marked shift away from paperboard and rigid containers. Lifestyle preferences are partially responsible for the trend, calling upon producers and contract packaging companies to meet the demand for convenient, portable food and drink containers. Lower costs – Flexible packaging offers cost advantages on multiple fronts. Production and transportation costs, for example, can often be reduced by shifting from rigid plastic containers to lightweight pouches. Better performance – From end-user performance advantages to better protection moving through the supply chain, flexible pouches outperform glass and other rigid structures on many fronts. With so many positive contributions resulting from moves to flexible packaging, it is easy to see why pouches are poised for further gains in coming years. But until recently, the packaging medium also carried negative baggage, serving as single use containers difficult or impossible to recycle. That is all changing as efforts to produce recyclable multi-layer pouches are yielding results. Dow Chemical Co. is at the forefront of sustainability advances in the flexible pouch industry, making recent breakthroughs in multilayer pouch recycling. The company launched a recyclable multi-layer pouch in late 2015, adding the specialized package to its existing RecycleReady line (the company previously devised a 100% polyethylene pouch). 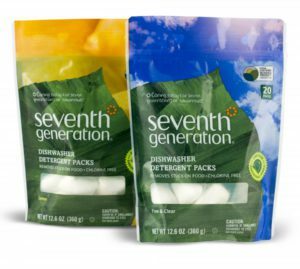 Initially used to market dishwasher detergent pods, the pouches bear information for consumers, instructing them how to recycle the packages. Moving beyond Dow’s early recyclable pouch designs, the company has now also introduced a fully recyclable stand-up pouch, made with proprietary polymer modifiers. The new pouches resemble the ones used for dishwasher pods, but also possess enhanced barrier characteristics. In essence, the new design offers the best of both worlds, acting like a recyclable, pure polyethylene pouch, while maintaining barrier properties needed to package diverse goods. Dow promotes its pouch as the first of its kind – a multilayer pouch that can be recycled in a polyethylene recycling stream. Traditionally, popular barrier combinations containing both polyethylene (PE) and ethylene vinyl alcohol (EVOH) were not suitable for recycling. The presence of EVOH commonly caused holes to develop in the recycled film, making pouches incompatible with polyethylene recycling practices. By adding a compatibilizer (Retain) at the beginning of the manufacturing process, Dow sidesteps the limitation, producing flexible stand-up pouches well-suited for film recycling. Like other members of the company’s RecycleReady initiative, the recyclable pouches incorporate label information sharing the How2Recycle logo and outlining the Store Drop-Off program for recyclable films. More than 18,000 locations accept items into existing polyethylene recycling streams. The company original developed Retain to help post-industrial recyclers reuse film. In a new twist on the proven technology, Dow is now able to incorporate Retain at the beginning of the pouch manufacturing process, resulting in a fully recyclable film that exhibits beneficial EVOH barrier properties. The ready-made resin combination can be accepted at standard film recycling locations, such as those positioned in grocery stores. Recyclable packaging offers benefits for producers, consumers and brand owners aligned with environmentally sound manufacturing and distribution practices. With the help of future recycling advances, packaging innovation will continue to divert more and more packaging waste from landfills and incinerators. According to Dow representatives, the future is bright for sustainable pouch packaging. Not only does the company plan to expand applications for its existing line of recyclable pouch solutions, but Dow also anticipates developing new compatibilizers. It is hoped these new alternatives will continue to enhance flexible pouch functionality without compromising recyclability – ultimately processing pouch materials like polypropylene, which traditionally interfered with recycling practices. Bolstered by cooperation across the entire supply chain, coordinated efforts to improve recyclable packaging practices are drawing support from industry giants like PepsiCo, Nestle and Proctor and Gamble. Materials Recovery for the Future, for example, represents a collaborative effort to improve flexible recycling outcomes. Flexible, multi-layer pouches are gaining ground in food and non-food applications. As the adaptable package format continues responding to consumer calls for convenience and flexibility, recycle ready alternatives are coming to market. Led by technological advances from Dow Chemical Company, recyclable multi-layer pouches are now integrated into existing polyethylene recycling streams. And as further breakthroughs emerge, the company hopes to bring-about similar solutions for other pouch packaging materials.